Baseball may be Taiwan's national pastime, but as in most countries where the game is played, it has remained almost exclusively a game for men. Taiwan's first women's baseball team was not founded until early in the 21st century, in 2001, almost a century later than the creation of its first men's team during Japanese colonial rule in 1903. Today, 17 years later, three pioneers are hoping to make baseball an even more viable option for female athletes in Taiwan after being signed to play in the world's only professional baseball league for women -- the Japan Women's Baseball League (JWBL). They are pitcher/infielder Hsieh Yu-ying (謝鈺瀅) and outfielder Shen Chia-wen (沈嘉文), who will play for the Kyoto Flora, and pitcher/outfielder Tseng Chi (曾琪), who will join the Aichi Dione. "It might be somewhat of an exaggeration, but I think they are like Chen Chin-feng (陳金鋒)," said baseball commentator Tseng Wen-chen (曾文誠). Much like Chen who became the first Taiwanese to play in the U.S. major leagues with the Los Angeles Dodgers in 2002 and opened the door to others like him, these women in their early 20s are "trailblazers" creating a new path that others can follow, Tseng said. Shawan Liao (廖立欣), the secretary-general of Taiwan Women's Baseball Advocate Association (TWBAA), called the signings "inspirational," saying that having these role models to look up to has given a morale boost to everybody who walks the lonely road of women's baseball in Taiwan. "Even more important, it shows that you can actually make a living if you play well enough," she said. Growing up a baseball lover like many Taiwanese, Liao said she has always loved playing baseball, but she found fewer women playing the game with her the older she grew. "There is a deeply rooted misconception in Taiwan that baseball is for men, softball for women," Liao says. What makes things worse is that Taiwan's women's softball team is very competitive internationally. As a result, most women who love baseball in their youth grow up to play softball instead, and they can now earn a living doing it with the formation of a semi-professional softball league in May 2016. But that does not mean they have forgotten their love for baseball, said Liao, who makes a living working in a breakfast restaurant. Taiwan's first amateur women's baseball team, named the "Kapok," meaning "silk-cotton tree," was formed in Kaohsiung in August 2001, followed by the Taipei Vanguard later the same month and the Taichung Sunflower in January 2002. Many of the players were former softball players who still had a passion for baseball, while others, like Liao herself, had little training but wanted to play for the love of the game. As these women played for fun at riverside parks on weekends, they sought out games with other teams from around the globe over the Internet. The result was the first ever series of games between teams from Taiwan and Hong Kong in August 2002, an important milestone for female Taiwanese baseball players to appear on the international stage, according to Liao. Though it might be surprising that the former British colony would have women's baseball teams, Liao said the relative obscurity of the sport in Hong Kong actually has made it easier to promote baseball for women there. "No one has any idea what baseball is in Hong Kong, so no one in Hong Kong has any bias against women playing baseball, unlike in Taiwan," she said. Another milestone came in 2004, when the first all-women's baseball tournament was held in Taiwan. Organized by Taiwan's Chinese Taipei Baseball Association (CTBA), the tourney was aimed at identifying players to form a national squad for the first Women's Baseball World Cup later that year. The national team ultimately finished last in the five-team tournament, but just participating was a triumph in itself. 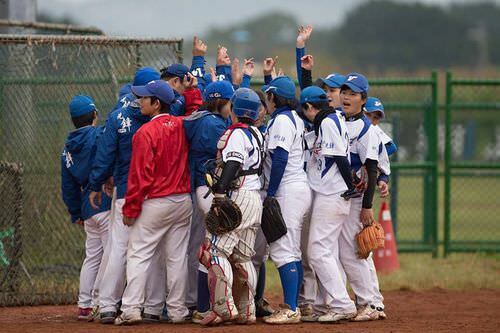 Since then, the CTBA has held an annual national women's baseball competition, and Taiwan's world ranking has improved. It finished fourth among 12 teams in the most recent Women's Baseball World Cup in 2016. Despite relatively good international results, however, women's baseball has struggled to develop any following at home, prompting the creation of the TWBAA in 2013 to raise the profile of the sport, hold games, and give training to players and coaches. It also holds international competitions with other countries or territories, including Japan, Korea, Hong Kong, the United States, Australia, and Guam, which according to Liao are the only places where there are substantial numbers of women playing baseball. With three Taiwanese heading to Japan to play professionally, the community of female baseball players in Taiwan is bound to be inspired and grow, Liao believed. At the same time, the three players are well aware they have a mission that is far bigger than themselves. "We will do our best to try to make the starting lineup soon," Hsieh said at the press conference in Taipei held to announce they would play in Japan. "By joining the league, we also hope to encourage others to follow." JWPL representative Aya Sugiura said the three were recruited not only because of their skills but also because of their desire to help other female players in Taiwan. "In the tryout interviews, all three of them said they wanted to play pro baseball in Japan because they hoped to later become coaches so they could return to Taiwan to promote women's baseball," Sugiura said. The four-team JWBL was founded in 2009 by a company with the hope of providing a career opportunity for female baseball lovers across the world, said Sugiura, who admitted that promoting the sport remains a challenge in a world where most people do not think baseball is a game for women. "But we believe that the more we do in promoting it, the more players will join," she said. "Ultimately we see great potential for women's baseball development in Japan as well as in Taiwan."